Designed and built in 1982 by the late Captain Thomas G. Fuller, who was one of Canada’s most decorated WWII naval war heroes, earning the name “Pirate of the Adriatic”. Originally sailed as a private yacht, Fair Jeanne is now in service as a sail training vessel for Bytown Brigantine, a non-profit organization dedicated to fostering leadership, confidence, and self reliance in youth through the adventure of square-rig sailing. During the summer months, she provides voyages for youth 13-19 years old and is also a floating high school. Launched in 1967, she spent twenty years fishing for cod in the North Atlantic. Abandoned at a Halifax pier, she was bought and converted into a 19th century Grand Banks schooner. #TALLSHIPSTUESDAY is back, y’all! 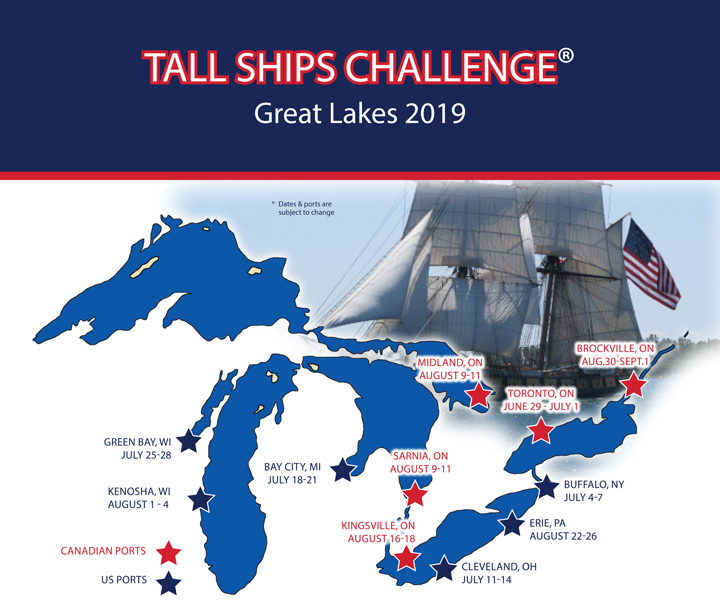 After a brief hiatus, we return just in time for the TALL SHIPS CHALLENGE® Great Lakes Race Series. These next few months will feature our fleet of vessels that you can see, hear, and touch when they come to your host city this summer. Let’s do this! The Empire Sandy was laid down in the shipyard of Clelands (Successors), Willington Quay-on-Tyne England on Dec 22, 1942. She was built as an Englishman/Larch class Deep Sea Tug with the added provision for mounting two Hotchkiss Anti-Aircraft guns. She was completed and went into service on July 14, 1943. Her first voyage commenced July30th sailing in convoy to Iceland. Voyages were usually done in convoys for protection against the German U-Boats. The Empire Sandy sailed in a total of sixteen convoys to her destinations. The 200-foot topsail schooner the Empire Sandy is Canada’s largest schooner. Built in 1943, she sails with 11,000 square free of canvas and has double cannons that are fired at special times. Sails are hoisted as the tall ship departs and the wind is harnessed to propel the 740 ton vessel along Toronto’s scenic waterfront. Wide expansive decks and wood paneled dining areas set the tone for a comfortable, exhilarating experience. Empire Sandy has hosted a variety of small and large groups including weddings, corporate events, dinner dance events canal tours and more. Moored at the foot of Spadina Avenue at Queens Quay’s is also certified for out of town trips. The name “brigantines” comes from the Italian word brigantino meaning a pirate ship and was associated with the vessels favoured by them in the Mediterranean. The two brigantines are specifically designed as sail training ships. Both ships sail the Great Lakes throughout the summer with a full youth crew aged 13-18, the exception being an adult captain. Each year, each ship sails over 4,000 miles, spends over 40 nights at sea, and introduces 300 trainees to the tall ship experience. Youth programs, school groups from middle school through college, and interested adult groups. After three glorious days at the Redpath Waterfront Festival Toronto, presented by PortsToronto, the ships started the first race of the TALL SHIPS CHALLENGE® Race Series. We had two very different ships participate – Pride of Baltimore II and Draken Harald Harfagre. With special help from the Ashbridges Bay Yacht Club, we had an awesome start with Pride of Baltimore II across the line within one minute of the cannon, followed three minutes later by Draken (no oars allowed!). Thank you to the wonderful Race Committee at Ashbridges Bay Yacht Club for a safe and well-organized start! This summer, we have a race in each of the Great Lakes. Winners will be announced at each of the finishing ports. Winners for this first race will be announced during the Tall Ships® Fairport Harbor 2016. Captain Jan Miles writes about the disparity between the two ships in his most recent blog post and provides some detail about life on board a tall ship during a race. PRIDE OF BALTIMORE II is part of a Millennium of Difference Race (my personal description). A race of sailing vessels of maybe the greatest difference of time of origin in the same race. The first of the 2016 Tall Ships America Great Lakes Tall Ships Challenge Race Series. Two vessels. The 9th Century era Viking Longboat DRAHKEN and the early 19th Century American Baltimore Clipper PRIDE OF BALTIMORE II. Only a thousand years apart in development. I wonder if this could be a record for spread of time between vessel origin in the Tall Ship Races of the world. It surely is for such races here in North America. Right now the 19th Century Baltimore Clipper is demonstrating what it takes to be able to go to windward rather effectively. The Viking Longboat is actually doing impressively well sailing to windward with her single big square-sail. I would guess on average she is 20 degrees less weatherly and about a full knot and a half slower. Earlier in the race the wind was favorable for heading to the first mark, meaning there was no need to get to windward. DRAHKEN was again slower but not by much. And when the wind went right aft PRIDE had to reach away from the rhumbline course to the mark to keep blanketing wind her fore & aft sails. DRAHKEN merely shifted her single yard to square. This year’s races are sponsored by Erie Insurance. I leave on Wednesday for our kickoff event for the TALL SHIPS CHALLENGE(r) Great Lakes 2016 Race Series. Wee! Redpath Waterfront Festival Toronto, presented by Ports Toronto, will be the first port to host the tall ships this summer and they always do a fabulous job of welcoming the ships and the crews to their lovely city. For all of the ports and information about their events, visit our website. While you are there, check out the fleet tracker so you can follow your favorite ship as they sail through the Great Lakes. While the interns will be blogging about their adventures as part of the Race Team, we’ll also be tweeting (@tallshipsfleet) and posting photos on Instagram (@tallshipsamerica). Follow us for updates about life on the road with the tall ships and general hilarity. We have eight amazing Host Ports this summer and I can’t wait to visit every one of them. Along with an incredible fleet of tall ships, it promises to be a banner summer. I hope to see you there! Official Host Ports and their event websites are here. It’s hard to believe but we are already planning our 2017 conference (it will be on the Atlantic Coast). Stay tuned! TALL SHIPS CHALLENGE® group on Facebook.